J.R.R. Tolkien, Bilbo comes to the Huts of the Raft-elves, 1937. Watercolor, pencil, white bodycolor, 242 x 190 mm. Tolkien: Maker of Middle-Earth offers a once-in-a-generation opportunity to see a remarkable collection of materials related to one of the world’s most beloved authors, John Ronald Reuel Tolkien (1892–1973). Tolkien’s adventurous tales ignited a fervid spark in generations of readers. From the children’s classic The Hobbit to the epic The Lord of the Rings, Tolkien’s stories of hobbits and elves, dwarves and wizards have introduced millions to the rich history of Middle-earth. Tolkien: Maker of Middle-earth—a new exhibition at the Morgan organized in collaboration with the Bodleian Libraries, University of Oxford—celebrates the man and his creation. 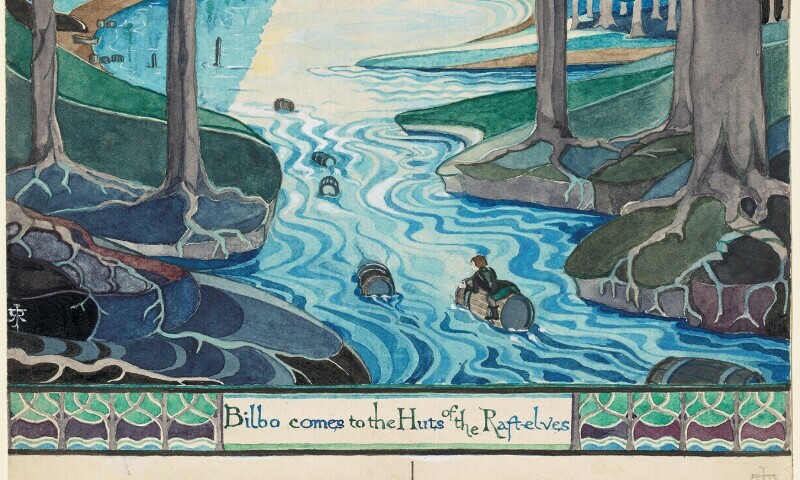 This exhibition provides the largest collection of Tolkien material ever assembled in the United States. First presented at the Bodleian Libraries in 2018, the 117 objects on view include family photographs and memorabilia, Tolkien’s original illustrations, maps, draft manuscripts, artefacts, and designs related to The Hobbit, The Lord of the Rings, and The Silmarillion. The exhibition guides visitors through Tolkien’s development as a writer and artist, from his childhood and student days, through his career as a scholar of medieval languages and literature, to his family life as a husband and father. It presents a unique opportunity to understand the intensely visual imagination, the dedicated scholarship, and the aspects of daily life that shaped Tolkien’s most treasured works.